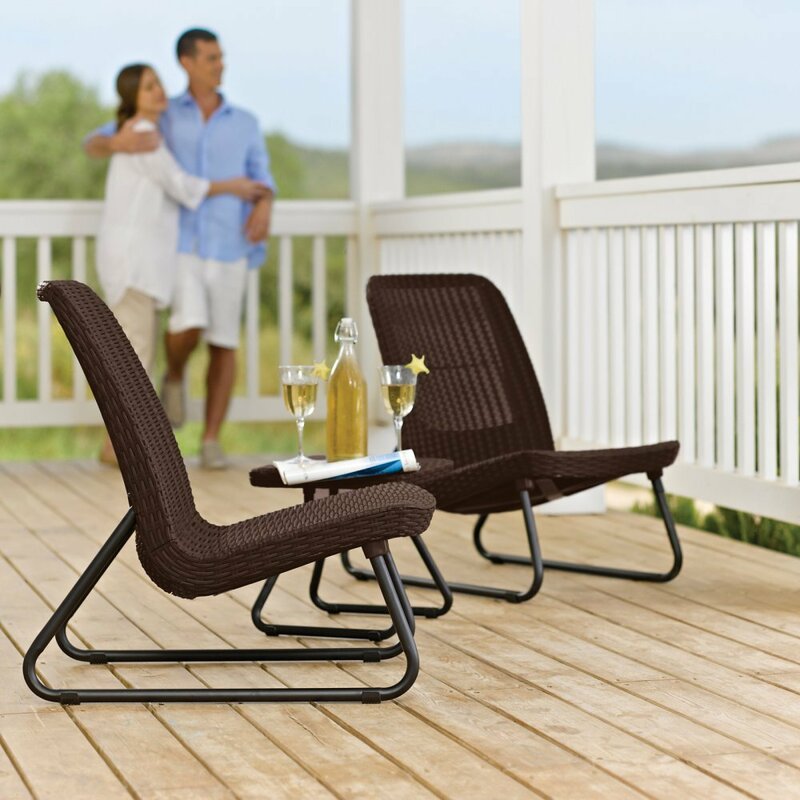 Home › Keter Rio 3 Pc All Weather Outdoor Patio Garden Conversation Chair Set Furnit..
Keter Rio 3 Pc All Weather Outdoor Patio Garden Conversation Chair Set Furnit..
Add comfort and style to just about any area with this lovely Keter Rio 3-Piece PatioSet, by Keter. This stunning set boasts a stylish rattan design, but it's actually made out of molded plastic. As a result, it offers superior comfort and exceptional durability. Unlike rattan, the polypropylene resin out of which this set is constructed is maintenance free, rust proof and suitable for all types of weather. When you invest in this attractive bistro set, you can rest assured that it will serve you well for a long time to come. If you're dealing with limited amounts of space, you will appreciate the compact size of this Rio set, which includes two chairs and a small table. The rattan portion of the chairs and table is a deep, attractive brown, which is neutral enough to work anywhere. The legs of the chairs and table are made out of metal and they are exceptionally sturdy and boast sleek, simple designs. The Rio set can be arranged however you see fit. Thanks to the manageable dimensions of the table and chairs, you can place them just about anywhere and mix and match them as needed. Traditional rattan furniture is susceptible to damage and can break easily. That's not the case with the Rio furniture set at all. Due to the fact that it's made out of polypropylene, this set couldn't be easier to maintain. You don't have to worry about rust, so you can safely leave it outdoors in all types of weather. This set will continue to look as good as new for many years to come and it is backed up by a two-year warranty. The Rio set arrives ready to assemble and putting it together couldn't be easier. Before you know it, you will be lounging and relaxing on one of the slightly reclined chairs and your icy cold drink will be sitting nearby on the matching table.